Vegan Smoked Almond Cheddar from This Cheese is Nuts! + A Giveaway! This vegan smoked almond cheddar from This Cheese is Nuts! 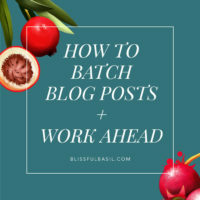 by Julie Piatt leans on incredibly simply methods (i.e., soak, blend, serve) and just five total ingredients. It’s smoky, tangy, and packed with zesty cheddar flavor. 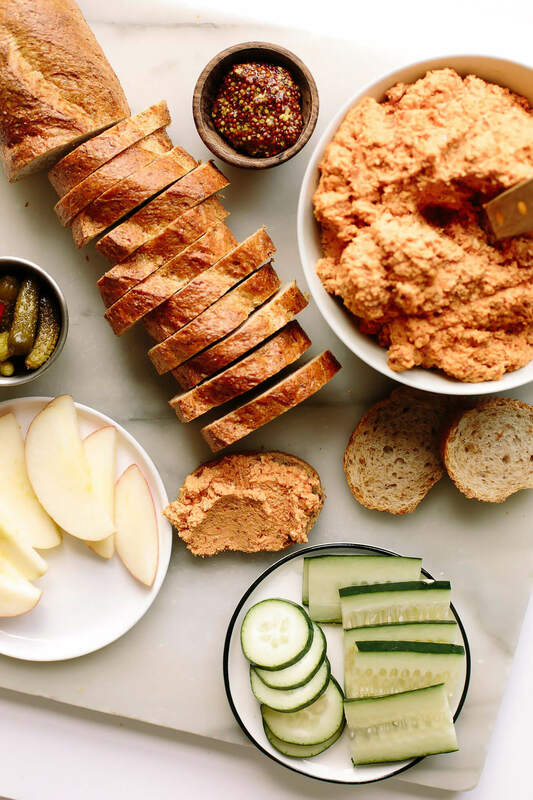 Slather this almond cheddar cheese over crackers or baguette slices, dip sweet pear slices into it, or layer it with crisp veggies in a flavor-packed vegan sandwich. This post contains affiliate links for This Cheese is Nuts! If you know me, then you know how true the following statement is: Just a few years ago, I was convinced I could NEVER go vegan because of my undying love for cheese. I simply couldn’t imagine life without stretchy, melty dairy cheese. No pizza? No epic cheese platters? No eggplant parmigiana? No mozzarella? Just the thought of parting ways with the gooey stuff was enough to give me the jitters. That was until the day I realized that cheese wasn’t doing me, my body, the planet, or the animals any favors. Since bidding dairy cheese adieu, I’ve come to learn that the ‘dairy’ part was really all I was saying goodbye to. The stretchy, melty, gooey, spreadable, sliceable deliciousness? Well, those latter bits were all still completely and totally possible thanks to some tasty store-bought alternatives. Something that says, Vegans and cheese-lovers, unite! You can have your cheese in any shape, color, ripeness, and size. And you know what? You can feel good, too. 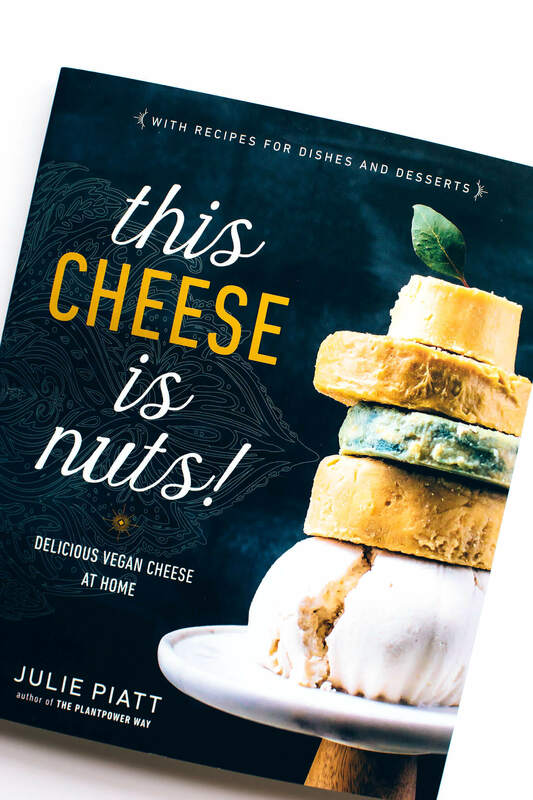 Well, today’s the day when vegans can thank their lucky stars and bust out all those lavish cheese knives and serving boards they’ve been hoarding since their wedding showers, because Julie Piatt’s latest book, This Cheese is Nuts! is brimming with recipes for allll the vegan cheeses under the sun. I’m telling you, if you can name a cheese, Julie’s probably got a plant-powered alternative for it in this book. As I’ve spent time flipping through the pages these last few weeks, I’ve been in awe of her creative brilliance. Whether you’re looking for a collection of recipes that runs the full gamut of vegan cheese possibilities—from blend-and-ready spreads to finely aged fancy cheeses—or you’re just starting out on your nutty cheese-making journey, this book has your back. This is hands down the easiest vegan cheese to make. To make it, you’ll simply soak 2 cups of raw almonds in water overnight. 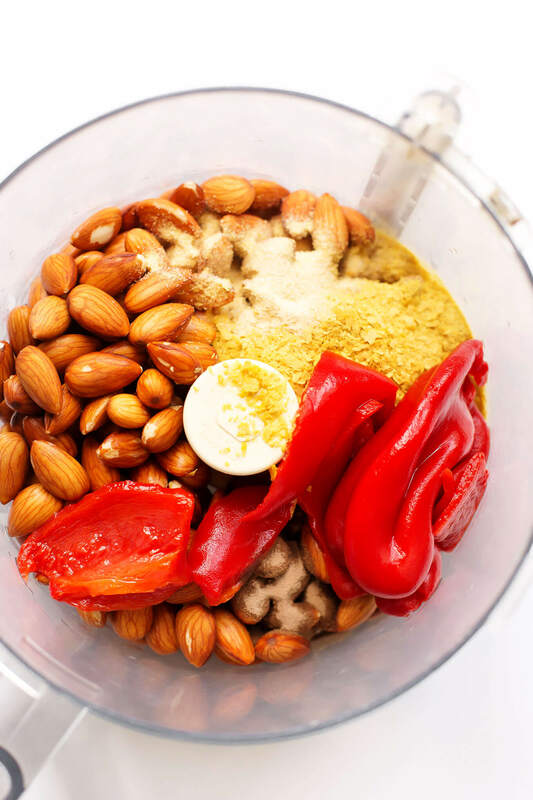 Then, drain the almonds and add them to a food processor along with pimientos (i.e., peeled roasted red peppers), nutritional yeast, smoke salt, and garlic powder. Blend until desired texture is reached, and serve. That’s it. Doesn’t get any easier, does it? Scroll down for the full recipe and enter for a chance to win a copy of This Cheese is Nuts! And if you simply can’t wait or take any chances on a giveaway, then grab your very own copy here. This vegan smoked almond cheddar from This Cheese is Nuts! 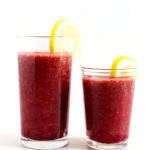 by Julie Piatt leans on incredibly simply methods (i.e., soak, blend, serve) and just five total ingredients. It's smoky, tangy, and packed with zesty cheddar flavor. Slather this almond cheddar cheese over crackers or baguette slices, dip sweet pear slices into it, or layer it with crisp veggies in a flavor-packed vegan sandwich. Author Julie Piatt | This Cheese is Nuts! Rinse the almonds well. Place them in water in a medium bowl. Cover and refrigerate overnight. Drain the almonds. 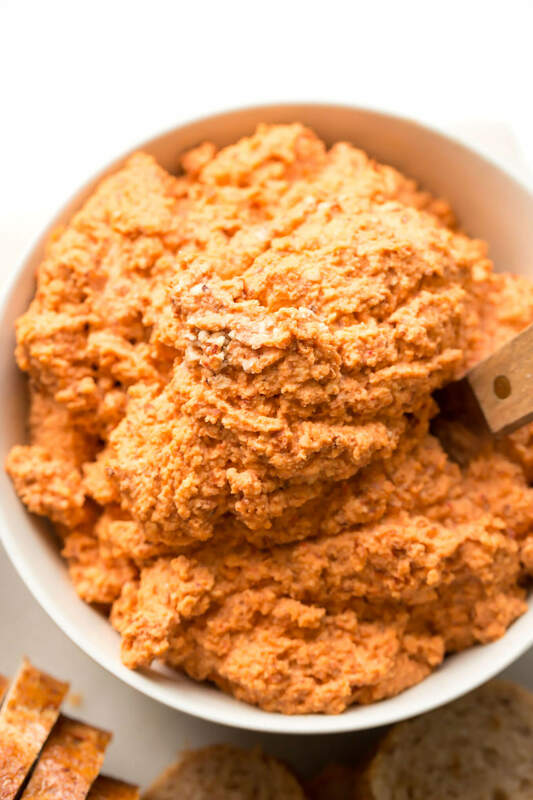 In the bowl of a food processor, place the almonds, pimientos, nutritional yeast, salt, garlic powder, and ¼ cup pimiento liquid. Process until the mixture is well incorporated. Remove the lid and test the cheese for texture and salt content. 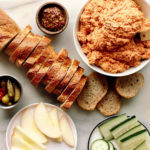 If you want a smoother spread, add pimiento liquid in small increments and process again. Add more salt if needed. Serve this with crackers and fresh pears. *Pimientos are peeled roasted red peppers, so if you have trouble finding them, simply peel jarred roasted red peppers and discards the skins. 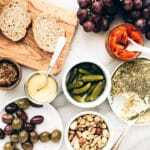 Reprinted from This Cheese is Nuts: Delicious Vegan Cheese at Home by arrangement Avery, an imprint of Penguin Publishing Group, a division of Penguin Random House LLC. 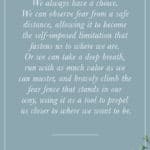 Copyright © 2017, Julie Piatt. One winner will receive a copy of This Cheese is Nuts! by Julie Piatt. For a chance to win, simply enter the giveaway using the Rafflecopter widget below and comment on this post between June 19th and July 3rd. Please note: this giveaway is only open to residents of the US and Canada. 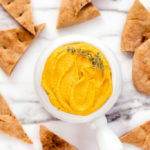 Pumpkin Hummus from Kathy Hester’s The Easy Vegan Cookbook + A Giveaway! I really ike to try new vegan cheese recipe, as I highly prefer the home-made one than thoses we can buy at the grocery. This cheese looks amaaaaaaaazing and I can’t wait to try it (and all the other cheeses of the book) to eat as a light meal in those hot-hot days in my apartment! Just said to my husband yesterday how I need a feta replacement! Been missing it a lot this summer! Thanks for the chance at the gjveaway! Violife makes a pretty good vegan feta. I also use the same feta to make Mac and cheese. Yum! I recently tried KIte Hill cream cheese and loved it. I would love to make some of that and also blue cheese!! Would lovE a vegan feta recipe! Cashew cheese sauce is a staple on our menu around here! I cannot wait to try this recipe! I love vegan cheese and have amazed several friends by how realistic my vegan “nacho” cheese is. So far I’ve only made spreadable cheeses but if I win this giveaway I would love to try a hard nut cheese!! I’m interested in nut-based cheeses, but I haven’t really delved into making them, so this book looks really interesting! I would like to share this with my family. They are FINALLY warming up to the idea of a plant-based diet!! Smoked Almond Cheddar sounds like something they would like. This looks simply amazing. I’ll be making this over the weekend for sure. I have been lactose intolerant since i was little! But I ate cheese because my mom refused to believe I had a problem. I loved it but when I hit high school, I could not handle it. It has been hard to find alternative cheeses especially where I live a rural desert. I have tried nut chess and have fallen in love but the are not available where I live :(. I would love to try the recipes on this book!! This looks tasty! Can’t wait to try it out and see what my kiddos think. I love trying different ways to make vegan cheeses. This Cheese Is Nuts looks so wonderful and I’d be so thrilled to have a copy! I love the title and play on words of this recipe book. I cannot wait to try this recipe (and hopefully others from the book soon). I am still searching for the perfect vegan feta! I was a fetaholic in my prevegan days. Still haven’t found anything that comes close. The vegan cheese revolution and maturity is just getting started. Would love to win this book! Thanks for the opportunity! Thanks for the love, Pat! Curious about this book and the recipes after hearing Julie discuss it with her husband Rich Roll on his podcast. Good luck to her! I’d love to win a copy because I am in awe of how amazing non-dary cheeses can be! I’m in need of some new staple recipes, and I just received a 5KG bag of cahsews so I need an excuse to use them ;)/. Whoa!! A 5KG bag of cashews?! Where does one acquire such a thing? I would love to make vegan bleu cheese. This looks delicious! Would love to learn how to make more vegan cheeses. I had the pleasure of trying this yesterday and WOW…I was impressed. Very satisfying and full of flavor. and yes it does taste like cheddar. I would like to win this book because buying vegan cheese can get expensive, and I would feel better knowing that I had made the cheese and had control of the ingredients. Wow! The photo with all the cheeses! The one with the green going through it..ash, whatever it is..amazing to be able to create legit cheese like this using nuts…can not WAIT to make some of these…I’m sold! thx for the chance to win! I would love to win a copy of this book! I’ve been looking forever for doable vegan cheeses and this looks like such a great book. I’m really hoping for a homemade cream cheese that is fairly realistic. I’ve had trouble finding a recipe and my store doesn’t carry any decent vegan alternatives. 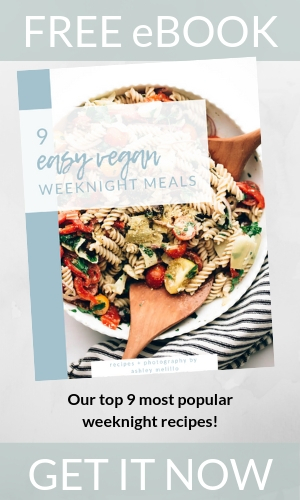 I love making tasty vegan food and can’t wait to try these recipes. I would be super excited about a yummy feta recipe! Thanks for the chance to win! Wow, this looks so amazing and I will definitely try it! It is so great that someone came up with a recipe book just for vegan cheese. Yes! I’d love to make some vegan cheese—to save money and keep the ingredients pure. I assume from the title that all the cheeses use a nut base. Is this the case? Hi, Terri! The vast majority of cheeses do use a nut base but there is a chapter with about 5 nut-free cheeses as well. Quality cheese alternatives are SO hard to find! This recipe looks so doable AND delicious! Love that this doesn’t use any odd ingredients! Can’t wait to try it out. good cheese is hard to find especially at a reasonable price. I would like to find a quality hard cheese. I love making vegan cheese. I haven’t found a chevre recipe that reminds me of the dairy based one I use to eat. I’m trying to convince my sons to eat plant-based and one of them is an avid cheese lover! Perhaps this book would help my cause. I really miss cream cheese so I would love to give that recipe a go. This all looks fantastic! I have such a hard time not being able to eat dairy when everyone in my house loves it. This looks delicious and the recipes listed sound fantastic too! It would be great to own a copy of this! I most excited to find a brie cheese that tastes like their dairy counterparts. I have been wanting to try to make dairy free cheeses for a while now and think this book looks like a great starting point! I bought the book…but if I win a copy I will happily share it with a friend! Wow, I’m drooling!! I want to make all of those cheeses, starting with smoked gouda. It was my favorite cheese since childhood, and somehow I didn’t mind giving it up because the thought of dairy just really turns me off. But if I could make a vegan alternative that tastes like smoked gouda, oh my. Still drooling, need to get my hands on this book asap. I’ve been so happy to find a yummy plant-based parmesan. Gah! Beautiful book! I can’t wait to try everything! Cashew Brie?! Yes please. I would be so excited to win this amazing recipe book!! 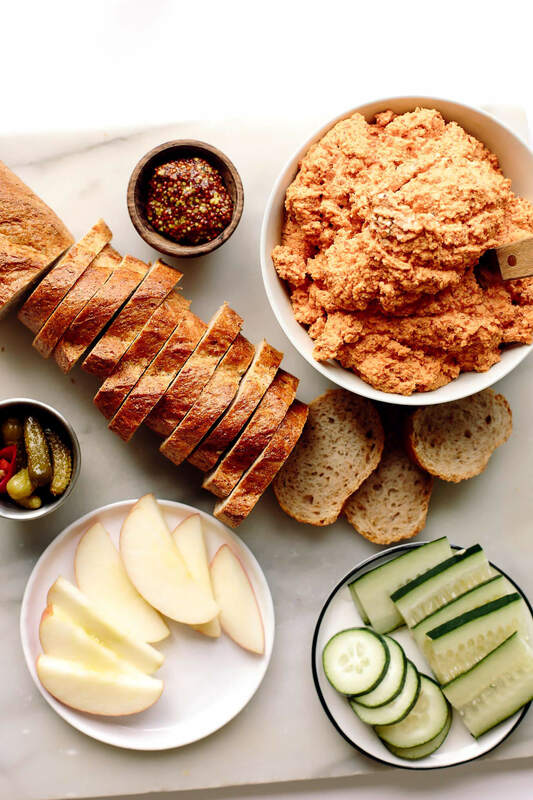 I’ve only ever made a cashew cheese spread, and thought it was SO good … I would love to try all of Julie’s recipes! Yes please! Having read and heard nothing but RAVE reviews of Julie’s masterpiece, I would be absolutely over the moon if I were to win a copy of my own. You see, as someone who is all for making as much as possible of your food yourself, I feel that this book would come in very very handy and would probably open up quite a few new doors for me. Further, seeing as I live with two extremely convinced meat, egg, and dairy consumers, what I’d love to be able to do is *wow” them with a homemade, delicious, HEALTHY, cruelty-free, whole food plant-based cheese alternative. Also, the one cheese I would want a truly awesome, whole food alternative for, would definitely have to be grateable parmesan. I’m a vegetarian who loves cheese but hates how it is produced. If I could find enough comparable vegan recipes, I would eliminate all cheese. I haven’t found one yet, but I would love a recipe for vegan asiago. I make a simple cashew mozzarella every week & would love to broaden my horizons-I resist using nutritional yeast & gums or seaweeds & appreciate the cleaner recipes. Store bought vegan cheese is just another processed “someone else tinkered with my food” food. This looks delicious! I have not tried nutritional yeast before and I imagine I can find it at Sprouts somewhere. I am thinking for the upcoming summer holidays, this would be perfect. Thank you for posting and for the giveaway. Oh my goodness! best discovery! I didn’t even realize I was missing this in my vegan diet but now I can’t wait to check it out. I have wanted to make vegan cheese for so long, and just haven’t dived into the pool yet, this book would give me the push off of the diving board that I need! Thank you for the chance to win! I’ve been drooling over all of Julie’s sneak peeks into the book and MUST get my hands on a copy!!! I’m most excited about a feta replacement – I know some have made it with tofu, but I haven’t tried. So delicious! I don’t really miss dairy cheeses, but the thought of having bleu cheese or burrata again is making me very happy. I had written those off as flavors and textures I would not eat again because they seemed impossible to recreate with nondairy items. I am so excited to try all of these recipes! I would love to have a recipe for vegan ricotta and make some vegetable, vegan ravioli. Growing up and living in Wisconsin, cheese is a way of life here . This appears to be an easy and a healthy plant based alternative. I can’t wait to try this. Wow, I’d be really interested to see how that burrata recipe is made! I just made a his and while the flavor was amazing the texture left much to be desired. Sorry to hear you didn’t enjoy the texture, Lissette! In the book’s description it talks about it being more of a cheddar spread so something to keep in mind. 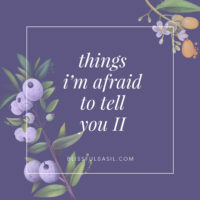 Thank you for sharing–I can’t wait to try this recipe! 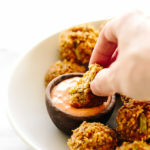 Easy vegan cheese recipes?? Awesome , I can’t wait to try thrm! I’d love to win this book. I have been wanting to try vegan cheese recipes but don’t know where to begin. A good ricotta recipe would be awesome. As for my favorite vegan cheese, I think it’d have to be treeline’s hard cheeses. Really great on crackers and mixed into sauces. This recipe looks so easy to make! I’ve been put off by some of the vegan cheese recipes that have 25 steps or a bunch of arcane ingredients. I’d love to find a vegan version of brie or of goat cheese. I’ve been vegan for seven years (whoa!) and I my 20-month old toddler loves Daiya cheese. In fact, it’s one of his favourite foods. He doesn’t like soft spreadable cheese (nor hummus), so I need recipes for hard cheese. Please let me know the percentage of recipes are for hard cheese in this book. What’s their complexity? I’ve made cheese using recipes from “The Homemade Vegan Pantry” by Miyoko Schneider, which my boyfriend couldn’t believe were homemade and dairy-free. I loved them too. If you’re familiar with that cookbook, can you please tell me how “This Cheese is Nuts!” compares? I’m also curious if the author of “This Cheese is Nuts!” address calcium issues and has any ideas how to ‘sneak’ calcium into vegan cheese. Thx. A Vegan Parmesan would be awesome. These recipes look great! Like you – the only thing holding me back is my love of cheese. I’d love to get my hands on this book because I think it would show me how easy it will be to replace my beloved cheese,, and that will give me that final push to make the commitment. I’ve been looking for just the right book to help me master vegan cheese. I think this is the one! Aaaaaah, I want to make and eat everything in this book! I can’t wait to try this recipe!! I love being vegan, but I do miss eating cheese sometimes. 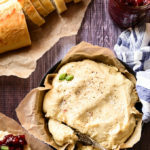 It’s always great to find new, delicious vegan cheese recipes. This book would be so great for me because cheese is hard for me and I’m not a fan of the commercial offerings. I miss blue cheese. I am a cheese hold-out. Mostly plant-based, but still love cheese boards in the summer with my hubby. It would be great to find a good melty grilled cheese substitute! To finally have cheese that tastes good and doesn’t leave you bloated. Vegan cheeses always amaze me, and this book looks so legit. Burrata! Mascarpone! I’m in love! I would love to get better at making legit vegan cheese to impress my non-veg friends and family! I loved being able to find vegan pimento cheese! I LOVE making homemade vegan cheese and was especially excited to have found both a tofu and macadamia nut ricotta that pass my 100% Italian taste test!!!! Yum! Always have wanted to learn to make a more diverse amount of nut cheeses. You’re herbed cashew was one of the first I tried and it’s still a favorite! I’ve been weirdly intimidated to try making cashew cheese myself, but maybe it’s time! Fancy cheeses are one of the things I miss and tempt me. 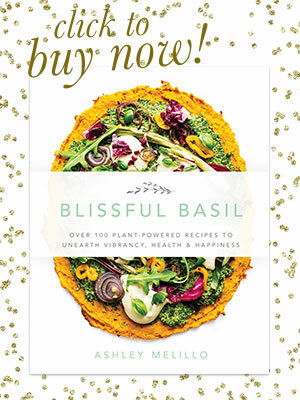 I’ve tried 2 out of the Blissful Basil cookbook that were better than any thing store bought I’ve tried yet. Excited to see this book! I would love to try these recipes! Nuts are the best! WOW! This recipe looks amazing! I would love some vegan nut-based brie and maybe a sharp meltable cheddar for pizzas and mammies. oooh, yum! I had an opportunity to borrow an ebook edition of this cookbook, and there were too many recipes to try in the two-week checkout time period. I’ve been wanting to buy this ever since. Of all the cheeses, I think brie might be up there! We’re doing Whole30 right now and I am so missing the cheese — so when I saw this book cross my Instagram feed, I started googling like mad. The recipe you’re sharing here has my mouth water! I neeeeeed! ;) Thanks for the giveaway! Only recently started getting into making my own vegan cheeses (after my grocery store stopped selling my favorite kale and mac cheese snack!) Would love to expand my cheesy horizons! I am now one week and two days into my new whole-food / plant based eating lifestyle. I love how I feel and have more energy now to exercise properly for even better health. However, I miss cheese!!!!! I am so excited by the alternative options I’ve read about and am especially interested in looking at all the recipes in “This Cheese is Nuts”. My husband, father-in-law, brother and sisters are anxious to dive into some of these recipes and get busy getting healthier! Thank you for your blog and this opportunity. 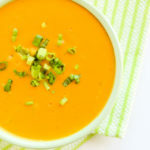 BTW…..your soup recipes are phenomenal! I am trying to go vegan so I can live a healthier lifestyle. This cookbook definitely has me intrigued, such an interesting concept-cheese without dairy! I would love to win a copy of this book!! !I mean, for this recipe alone…but I’d really love to find an alternative to mozzarella!! I hate to be a Debbie Downer, but I tried this recipe last night… and it was awful. Purely and totally awful. I followed the directions to the letter. Am I missing something here!?!? I was SUPER excited about this book but now I’m not so sure. Is this an acquired taste? Hi, Kim! So sorry to hear that you didn’t enjoy this recipe. It’s supposed to be more of a cheddar spread rather than a firm cheese, so the texture leans toward lighter/flakier than many nut cheeses. Was it a texture or flavor issue for you? I personally find it to be delicious, but could see it catching me off guard had I been expecting a firmer, smoother cheddar cheese. I haven’t had a chance to make other recipes from this book yet but am planning to in the coming weeks and would be happy to report back! Also, assuming you did because you said you followed the directions to a letter, but just to double-check: you did use smoked sea salt as opposed to regular sea salt, correct? A swap there would make an enormous difference and would completely alter the flavor, which is why it’s worth double-checking! Can I make my own smoked salt and if you have a recipe for it or is it better to just buy from the store? Hi, Lili! I’m sure homemade smoked salt would work great in this recipe. If you've made the recipe, please feel free to rate it! Subscribe to Receive Recipes by Email!